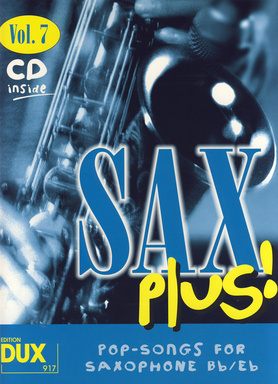 Edition Dux Sax Plus Vol 7 - for Bb and Eb saxophone. Songs: September (Earth Wind & Fire), The Pink Panther Theme (Henry Mancicini), Cantaloupe Island (Herbie Hancock), Europa (Santana), Street Life (The Crusaders), E.G. Blues (Mezzoforte), Peter Gunn (Henry Mancini), Don't Know Why (Norah Jones). Eight songs arranged for solo saxophone. Intermediate level. Includes professional playalong CD.